Two story home with 1 master bedroom with en-suite facilities, family room, dining room, full kitchen, pool. Attached to Golf Course. This two story home is perfectly positioned to offer our guests a wonderful vacation. 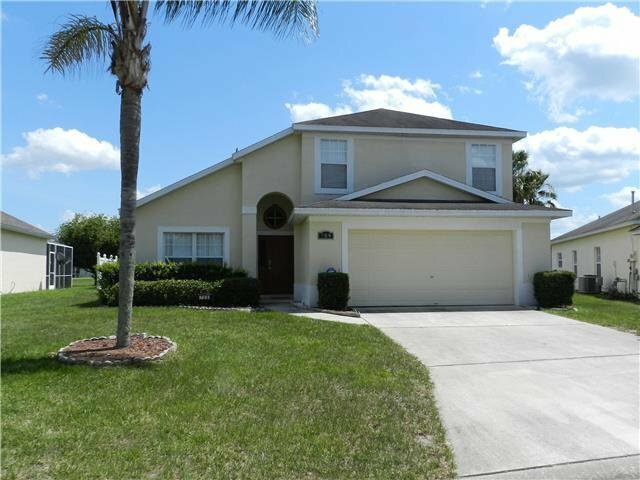 Less than 15 minutes to Disney World, close to stores and restaurants and situated on a quiet community with a pool overlooking the golf course this promises to be a very popular home. The home has 4 bedrooms, 2 bathrooms including a king master, one queen bedroom and two twin rooms. There is a comfortable living area, full kitchen and dining area. There is also a full size pool table in the home which has the advantage of air conditioning which is not always the case when the games room is in the garage. Esprit is a popular destination with our guests because of the closeness of the parks, the golf course and the wildlife which you can sit and watch as you relax by your pool. It is not uncommon to see rabbits scurrying in front of you when you drive home, or to see cranes as they stroll through the neighborhood. The large 600 acre Lake Davenport is fully stocked if you would like to fish off the jetty, or if you have your own boat there is a boat ramp onto the lake. You also have tennis and basketball courts, a children's play area and a community pool all within a short walk from this lovely home. Esprit is a popular destination with our guests because of the closeness of the parks, the golf course and the wildlife which you can sit and watch as you relax by your pool. Please note: We reply to all inquiries within a few hours. If you have not heard back from us within 24 hours (to allow for busy periods) then please check your SPAM files. Thank you.